Why do organizations report GHGs (Greenhouse Gas)? Organizations start GHG reporting for a number of reasons. In some countries, reporting is mandated by the government for all organizations or a percentage of the highest polluters. Other times, climate mitigation efforts are spurred within an organization when the mission compels it. Reporting GHG emissions is frequently good business too, as customers are now demanding climate transparency through reporting. Access to more data makes it easier to find data trends and areas for increased efficiency, plus it gives the organization a competitive advantage in the marketplace. 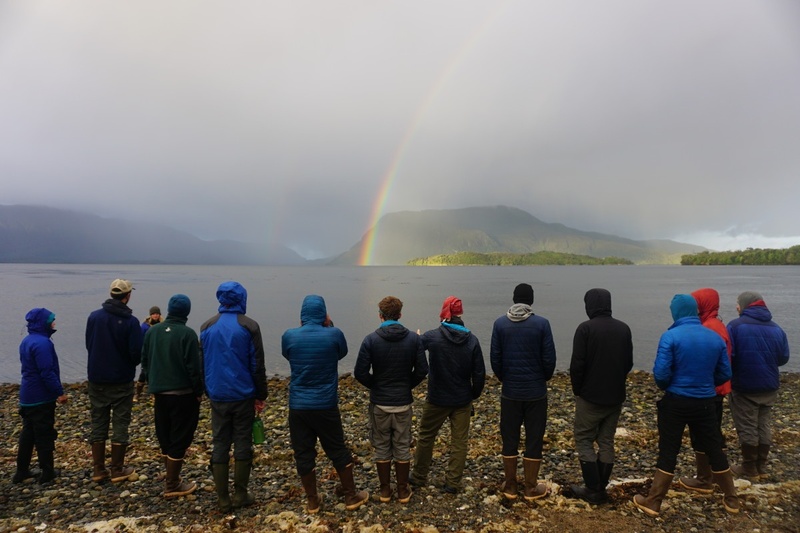 For NOLS, environmental stewardship is ingrained in our school mission. Our directive to be good stewards reaches from our backcountry Leave No Trace ethics to our frontcountry sustainability and environmental public policy efforts. What’s the impact of organizations doing GHG reporting? 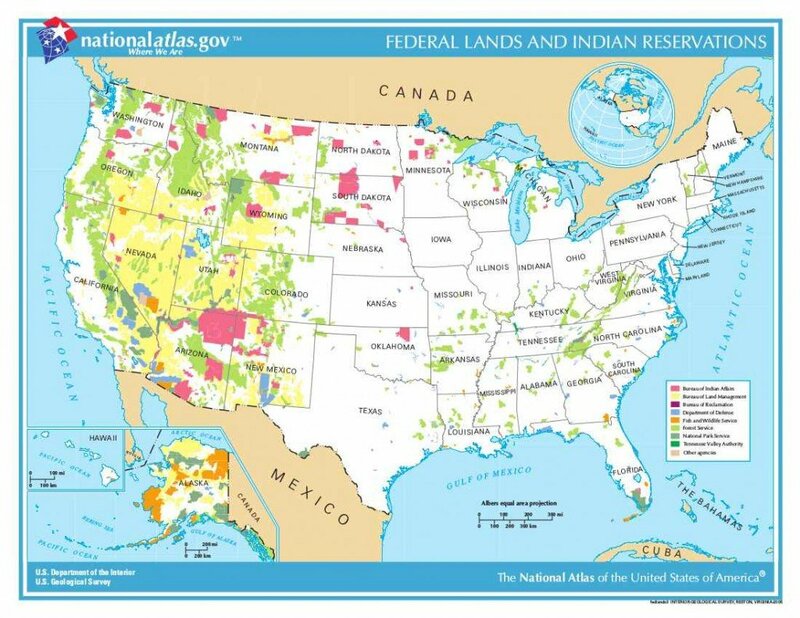 Truly impactful climate change mitigation comes when we have multiple entities, such as companies, states, cities, tribes, faith communities, and colleges and universities, all coming together around the country and around the world to reduce their GHG footprints. Even as the U.S. pulled out of the Paris Climate Agreement, major players in these sectors, including NOLS, have reaffirmed their commitments to climate goals. Doesn’t outdoor recreation automatically have a low emission rate, since most of the activity is human-powered? Why bother reporting on those activities? 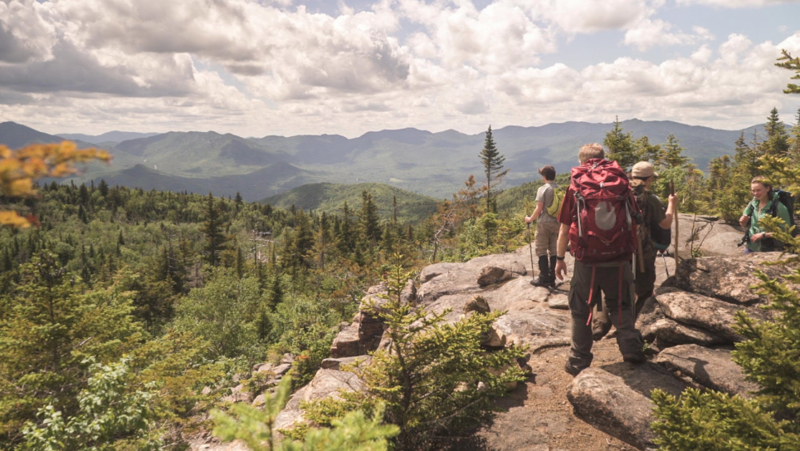 While activities such as backpacking, climbing, and kayaking have no direct emissions associated with the sport, we also have to keep in mind the support systems of those activities. 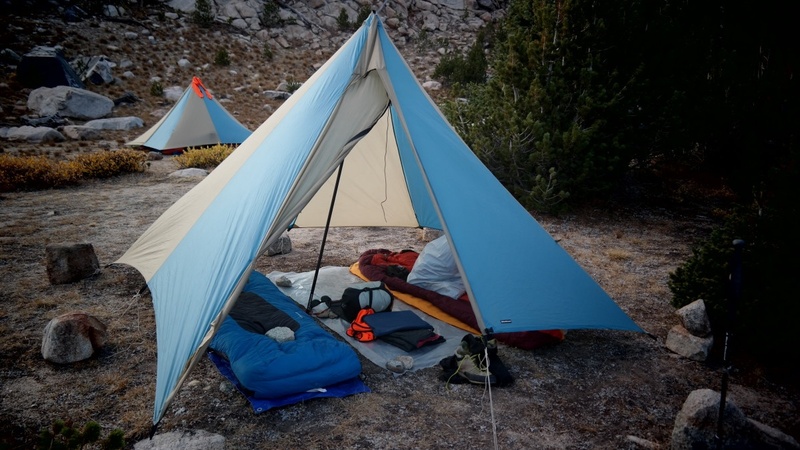 For example, all NOLS courses use some sort of camping fuel to prepare meals. What may seem like a small amount of fuel for one course adds up when you consider all the courses cooking in the wilderness throughout the year. NOLS Rocky Mountain, for example, averages about 975 gallons of white gas per year. Once we add in the other support services of transportation, campus electricity, and heating fuel, we’ve got ourselves a GHG footprint. What goes into carbon reporting? The most important first step in tracking GHG emissions is defining the scope of the reporting boundary. Are you going to account for emissions upstream associated with the extraction, manufacturing and transport of a product or service? What about the downstream emissions associated with the end use of that product? The best practice for defining scope entails reporting on the most relevant aspects of our operations. For example, at NOLS, commuting is not a material part of our GHG footprint since many of our seasonal employees live on-campus and our in-town employees live near the communities where we operate. 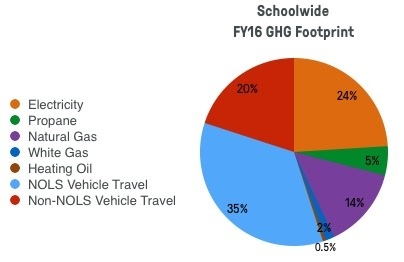 We do, however, track GHG emissions from transporting NOLS students to and from their course destinations, which accounts for 35 percent of our footprint. To learn more about NOLS’ GHG reporting methods, see the NOLS FY16 Greenhouse Gas Emissions Footprint. Why are some reductions harder to make? Built-in emissions: At NOLS, we value having our campuses close to wild places—it connects us to the places where we operate. There are trade-offs to this remoteness. Our students, instructors, and seasonal in-town staff must travel longer distances to reach us, for example, and it can be harder to get utility services and other products and services to the campuses. Conversely, at our Mexico campus, for example, we are so remote that there are no utility services. We’ve been able to create a lower environmental-impact campus by running almost completely off of solar panels, grey water recycling, and rainwater collection. “Essential” emissions: Flying is often thought of as an essential emission source for certain activities. Whether it’s attending a conference, face-to-face marketing, or forming relationships with donors, these experiences and relationships can be best formed by being physically present. While using video conferencing technology whenever possible reduces travel emissions, there is still a place for travel in organizational operations. Growth: Growth can make total emissions reduction very difficult because, as the quantity of products or services increases, so does the need for additional resource inputs. An organization can make efficiencies, which will lower the intensity at which GHG is emitted, but still not see a reduction of total emissions. Behavior change emissions: We all know that some habits are hard to kick. Behavior change emissions can source from behaviors as small as turning off the lights when you leave a room to wearing warmer clothes during the winter months instead of turning on space heaters every day. How is NOLS doing in reaching its GHG reduction goals? To answer this question, we must look at the big picture of what’s been going on at the school. For one thing, our student days have grown by 12% since 2009. With this growth comes the need for more resources to support those students, such as: more vehicles traveling to trailheads, more in-town staff using facilities, and more emergency services, such as aviation evacuations. 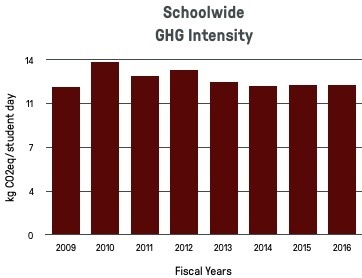 While our student days have grown, we’ve managed to keep our overall footprint steady, which means our GHG intensity has remained fairly steady. 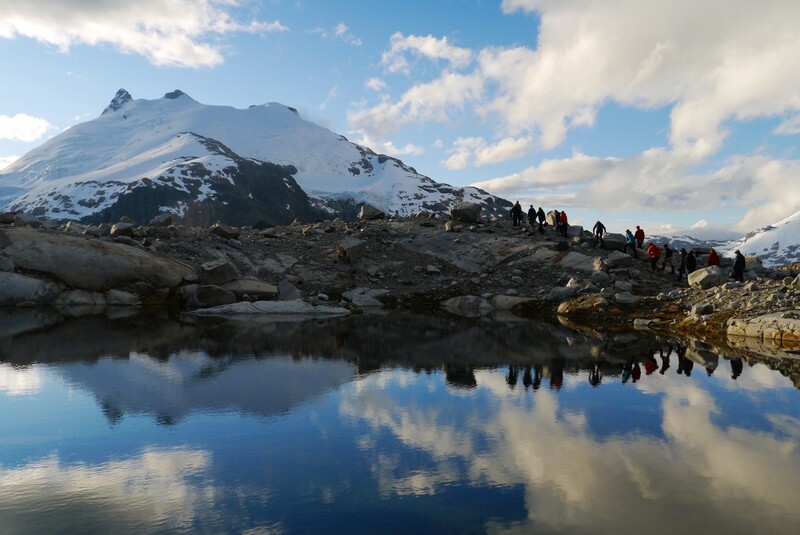 What are NOLS’ future plans to achieve our GHG goals? 1. Locate emission sources that can be lowered by replacement of a product or service. Examples: Install more solar panels at NOLS-owned campuses; continue to incorporate more 15-passenger vans into our fleet to reduce the number of vehicles needed on a course. 2. Look for systems we can easily make more efficient. Example: Coordinate for more efficient course pick-ups and drop-offs to reduce the amount of travel to and from a NOLS location. 3. 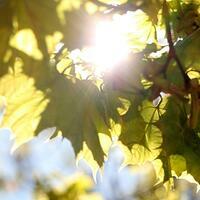 Research reputable carbon offset organizations that match our mission. What are carbon offsets and how do they work? Carbon offsets are a set amount of greenhouse gas emissions (one metric ton) that can be purchased on a regulated carbon offset market. All reputable carbon offsets should be: real, additional (without the project, GHGs would not be reduced), based on a realistic baseline, quantified and monitored, independently verified, permanent, and retired once purchased. The following project certifications are considered reputable in the carbon offset marketplace: Gold Standard, Verified Carbon Standard, and the Climate Action Reserve. Carbon offsets serve an essential purpose for organizations trying to reduce their GHG footprint. No matter how much an organization attempts to reduce their emissions internally, there will likely be emissions they simply can’t reduce further. When an organization gets to this point, they can outsource their emissions reduction to certified projects that are still making a quantifiable impact on emissions reduction. What are some things you can do in daily life to reduce emissions? You can start by calculating your own GHG baseline footprint. There are several websites that will calculate this for you: the U.S. Environmental Protection Agency’s detailed calculator, or Berkeley’s interactive CoolClimate Network calculator. Once you know and understand your GHG footprint, set S.M.A.R.T.E.R goals and make an action plan. Start with a bite-sized tasks, such as meatless Mondays and leaving your car at home two times a week. Then you can gradually move up to being an environmentally-conscious consumer and coordinating travel to accomplish multiple tasks in one drive or flight. Don’t leave your GHG footprint on the shelf to collect dust. Reassess your GHG footprint every year to track your progress and set new goals. And guess what—carbon offsets are not only for organizations. Individuals can also purchase carbon offsets for those built-in or essential emissions. If everybody—organizations, governments, and individuals—comes together to take serious steps towards climate change mitigation, we have an opportunity to make a real impact in this world. Take a deeper dive into the NOLS GHG footprint by checking out the NOLS FY16 Greenhouse Gas Emissions Footprint. Kara is the sustainability coordinator at NOLS.